Hey guys. Been trying to ID this species of what I believe to be cockroaches. Found them while searching around in the FL Keys. They were living throughout the mixed substrate on the ground, and I originally collected about 10. So far they’ve been slowly reproducing in a mix of organic potting soil, bran, saw dust and wood chips, and cocoanut fiber. Last count was a few days ago and it was roughly 20 not including the small babies. I couldn’t get all of them out of their container and substrate mix to do an almost exact count. Also, do you guys ever combine species of cockroaches together? How does it work? I’d really like to put my Dubias with these guys as ther setup is much better than my Dubia setup. Sorry for the image quality. Really thought it was more clear then this. Ok, i found them again. Its populations are almost exclusively female, and it reproduces asexually. I believe your right with the ID. I actually wasn't sure if this species was in Florida, so I wasn't sure myself. Yup, those are Surinam roaches, found tons of them while I lived in FL. 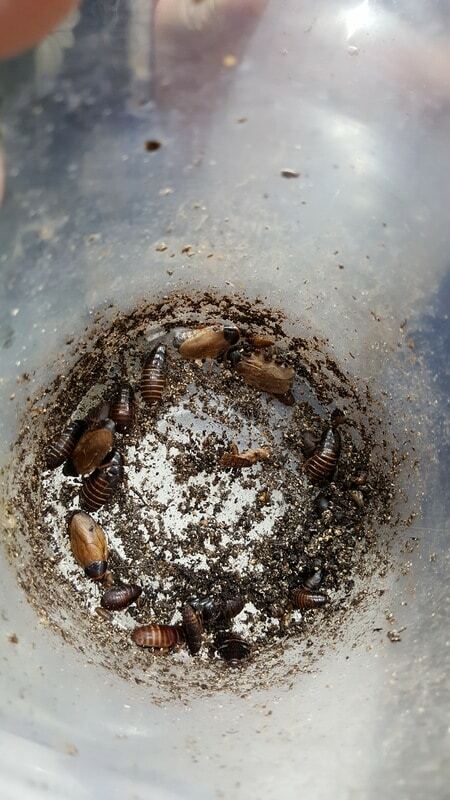 I wouldn't house dubias and surinams together, the Surinam roaches need several inches of substrate to breed well, and most people keep their dubia roaches without a sub. Plus I'm pretty sure the surinams would outcompete the dubia fairly quickly, Pycnoscelus surinamensis is a fast and prolific breeder, especially since every individual is a female that reproduces asexually, (except for the rare, sterile males that pop up in cultures every now and then). How do i tell if mine are male or female? I was thinking the wings would be a dead giveaway, but maybe that's not the case with this species? @Loops117 wrote: How do i tell if mine are male or female? I was thinking the wings would be a dead giveaway, but maybe that's not the case with this species? Males are extremely rare and you may go your whole life without seeing one in your colony. They are thinner than the females and have slightly longer wings. Were yours easy to keep? I figured with 2 months in their container, they would have produced more? Not sure, but it's obvious they're eating with gasters like that. @Loops117 wrote: Were yours easy to keep? I figured with 2 months in their container, they would have produced more? Not sure, but it's obvious they're eating with gasters like that. Yeah, they are one of the easiest species of roach to keep ever! Perhaps try feeding them more fruit? Mine aren't too picky and don't seem to need fruit for reproduction, but maybe since yours are a different strain they need more fruit in their diet to produce offspring? Im not sure. I'm still trying to figure out what they actually like. I put the normal carrots and potatoes in there for them. I never see them eating, so i don't know what they're actually liking, and when i tak e their food out, it's usually too disfigured and dirty for my to tell if there has been any munching. They're in the same setup as my dubias, and get the same diet as them although my dubias come above surface for their food while the surinams stay hidden. So i can see them eating their food. The surinams also seem to be more skittish then my dubias as well. That would be due to them being wild collected over the dubias being captive bred. Not sure. @Loops117 wrote: Im not sure. I'm still trying to figure out what they actually like. I put the normal carrots and potatoes in there for them. I never see them eating, so i don't know what they're actually liking, and when i tak e their food out, it's usually too disfigured and dirty for my to tell if there has been any munching. They're in the same setup as my dubias, and get the same diet as them although my dubias come above surface for their food while the surinams stay hidden. So i can see them eating their food. The surinams also seem to be more skittish then my dubias as well. That would be due to them being wild collected over the dubias being captive bred. Not sure. Well, I remember when I git my first starter colony, they seemed to be breeding rather slow, but trust me, once they get going you'll have tons of them! No, them being skittish is not due to them being wild caught, this species is just naturally skittish, and they don't like being exposed. Ok cool, i'll continue to leave them alone before i pull some to feed to my ants. No problem, hope they do well for you and start breeding more prolifically!